I received this new Chicken Soup for the Soul book this afternoon, but never intended to sit down and read it cover to cover. But, after flipping through a few pages while the girls were going down for a nap, I found myself intrigued and wanting to read more. I thought I would read just a few stories, but in less than 2 hours, I was able to read this book cover to cover. It was hard to put down and really got me to thinking about changes I wanted to make in my life. "Chicken Soup for the Soul: Time to Thrive is filled with 101 inspiring stories about growth, wisdom and dreams. These empowering stories will motivate you to create balance and more meaning in your life. Read how others have flourished instead of floundered in the face of challenges, pursued their dreams, and changed their focus and their lives." This book was co-authored by Life Coach to the Rockstars Loren Slocum Lahav - You can read more about her on her website: http://lorenslocum.com. Thriving comes in many forms, and this book covers everything from minor adjustments to complete overhauls. Whether your life needs a little tweak or a major change, these stories will show you how to thrive. You’ll learn how to take charge of your future, make time for what’s important, and do what’s right for you. You’ll read about carving out time for work–life balance, learning how to say no, and making your own needs important again. You’ll be inspired by stories from people who have reinvented themselves, chucked it all to follow their dreams, and flouted convention by striking out on their own paths. You’ll also read about people who conquered their fears, embraced adventure and learned how to say yes to new things. As a stay-at-home mom I find myself getting into a routine and sticking with it as it seems to work. But, I know I could be handling certain things better and being much happier if I was just confident enough to make the first move to break out of certain ruts and thrive towards a more meaningful and purposeful life. If you find that you are needing to tweak certain parts in your life, or you need to make a major change life change jobs or follow your dream, you will find yourself inspired by the personal stories shared. I especially enjoyed reading the work-life balance stories, as I find this to be a difficult thing to do now that I am a mom, trying to juggle taking care of the kids, the home and blog. There just seem to be enough hours in the day. But, I did take notes during my reading today and can't wait to try out some of the ways shared to help carve out time work-life balance. 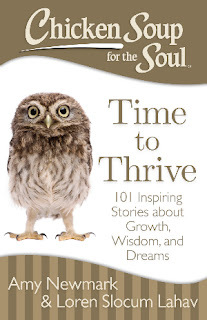 Fans of Chicken Soup for the Soul will love this book. It will make for a great summer or beach read, and one book you will be passing along to friends and family, as everyone is always looking to make change (big or small) for a more fruitful and fulfilling life. Thanks to the folks at Chicken Soup for the Soul, three (3) lucky Inspired by Savannah readers will win a copy of this new book. To enter, please complete the entries on the Rafflecopter form. Good luck! I do not have a favorite yet but I own about 12 of them so far. I love every one of them. I always love the animal stories, like "My Cat's Life"